The Euronext Currency Derivatives product provides real-time tick by tick (full market depth) data for Euronext Currency derivatives. Euronext offers low latency, high-performance data feeds using multicast technology, and providing pre-trade and post-trade data from the Euronext Derivatives market. 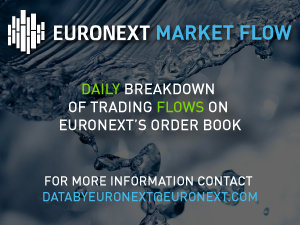 Real time market data for Euronext is distributed via low latency direct feeds (XDP) and through authorised data vendors. XDP feeds are available over the Secure Financial Transaction Infrastructure® (SFTI®) network.